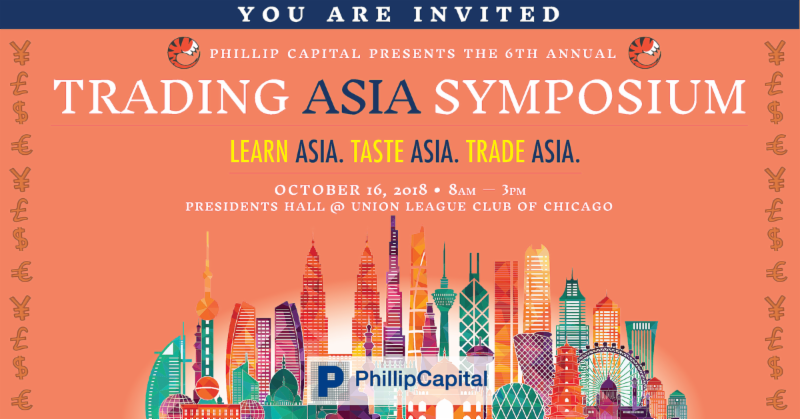 Join us at Phillip Capital's 6th Annual Trading Asia Symposium! 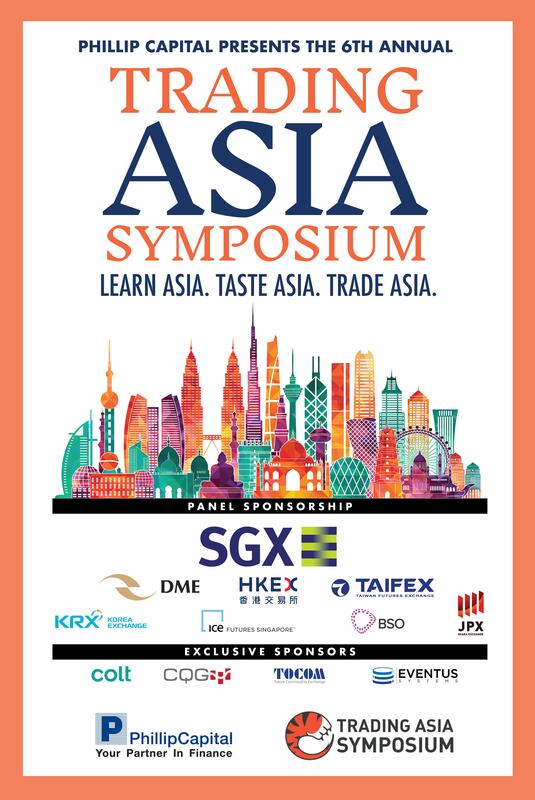 Whether you are a trader looking to trade into Asia or an industry veteran, join your industry peers where you learn from the major Asian Exchanges about the latest developments in their markets and trading opportunities. Attend a workshop that dives deeper into the subjects of your interest. Enjoy authentic Asian food while networking.Each year we strive to make it bigger and better so this year our goal is for you to experience Asia with all your five senses. While you use your ears and eyes to learn from the panels and the interactive workshops; you will also use your eyes and tongue to feast on the authentic spread of food. But what better way to further evoke the sense of smell then with the aroma of coffee? We have invited a professional coffee expert from Asia to host a coffee cupping event where you will taste some of the finest and most exclusive batches of coffee including Coffee Luwak. Singapore is more than just a place where chewing gum is banned; where the historic summit between Kim Jong Un and President Donald Trump was held; and where the movie “Crazy Rich Asians” was based. Singapore can also be your base to trade Asia. Whether you are looking to set up a presence in Singapore physically or trade from US, get your answers here. Learn about the different tax and business incentives available as well as ways to access the markets and opportunities. There is sort of a love-hate relationship between China and the US within the trading community. While we all know the importance of China as a world power, how do we get access into trading in China without taking too much risks or making rookie mistakes? There are no easy answers. In this frank discussion, join Lynette Lim, Co-CEO, Phillip Capital, as she asks business experts in China markets about the nuts and bolts of trading in China and what it entails. We will also attempt to understand how the futures market has evolved in China and what the current opportunities for traders and money managers are. As humans, we prefer things are familiar, and hence a new challenge like trading a new market can be daunting. How then do we learn to train our minds to embrace change and increase our focus, enjoyment and resilience? Russ Raush, a 16-year trading industry veteran (currently dedicated to training sports teams like the Altana Falcons and the Seattle Mariners and other traders) will lead a discussion on training your brain to have a performance mindset. To take part in this session, we would appreciate you providing your questions in advance, so we can prepare as much as possible and ensure we cover as many of your questions as possible. Lynette Lim, Co-CEO, Phillip Capital Inc.
Lynette Lim is Co-CEO of Phillip Capital Inc. She directly oversees risk, IT development, marketing and E-trading functions and is indirectly responsible for all other areas within Phillip Capital. Ms. Lim is a NFA registered Principal since August of 2010, and registered NFA Member and Associated Person since February 2011, and founded Phillip Capital in April 2010. Previously Ms. Lim worked for the Phillip Capital Group of Companies for 9 years. While there she managed an IT group that developed internal projects as well as customer projects in the financial industry. She also managed the development of POEMS which was the first online stock trading system in Singapore (launched in 1996). Ms. Lim received a bachelor’s degree in computer systems engineering with honors from Warwick in England and an MBA from the University of Chicago. Maureen Downs, Advisor, Phillip Capital Inc.
Maureen C. Downs is a futures industry executive who currently works as an advisor for Phillip Capital Inc. She joined Phillip Capital in February of 2018. Maureen has over 30 years futures industry experience and most recently served as the President of Rosenthal Collins Group LLC and RCG Holdings LLC and currently resides on the boards of FIA Americas and FIA Technology Services, and is a member of the NFA Compliance Consultative Committee. David Klotz, Head of Business Development, Phillip Capital Inc.
David Klotz is a 20 year futures industry veteran, with a background in electronic trading, David was previously head of E-trading before becoming head of business development for Phillip Capital. As head of business development, David interacts daily with Phillip Capital’s global exchange network and international affiliates, providing him with good insight into the Asian market space. David has been involved with Trading Asia since 2015 and has moderated the event for the past two years. Previous experience includes time with Mizuho Securities, Born Technologies & ABN AMRO. Rama Pillai is a Singapore-based exchange executive who currently serves as senior vice president and Chief Commercial Officer at Singapore Exchange Limited (SGX) in charge of membership and international coverage of all SGX products. Since he joined the exchange in 1993, Pillai's several responsibilities have covered the marketing, business development and product development efforts for the SGX's derivatives and securities business. As Senior Vice President of Partners, Chris is responsible for the international development and management of the market maker client base and building strategic relationships with international industry associations and technology providers to drive business growth, across all asset classes. Chris joined HKEX in 2015 and brings over 25 years of financial services development, leadership and management expertise to the company. Chris joined HKEX from ABN AMRO Clearing NV where he was most recently the Global Head of Execution Services, responsible for developing and managing global execution services providing infrastructure and trading services across equities, derivatives, commodities and FX. Prior to this, Chris held a number of sales trading positions with BARCLAYS Capital, NatWest markets and was managing director for a large electronic trading provider in the UK. With nearly two decades of experience in the trading of futures and options, risk management, compliance and interaction with multi-national regulatory bodies, James is responsible for the entire gamut of customer relations activities in the exchange- a role he took up in July 2013. Prior to moving to the DME, James was the Chief Executive Officer of the Dubai Professional Trading Group (DPTG), where he oversaw both the trading floor and the risk desk, attracting a 20% increase in professional traders and running a highly successful trader training programme that added 30% more traders to the professional trading floor in under 12 months. In this role, he was focused on making the risk operations compatible with regulatory guidelines and rules of the Dubai Multi Commodities Centre (DMCC), Securities and Commodities Authority (SCA) and Financial Services Authority (FSA) in the UK. James spent five years with DPTG where he joined as Head of Trading before moving into the Acting Chief Operating Officer (COO) position and then finally transitioning to becoming the CEO. Allen Lin is the Senior Executive Vice President at the Taiwan Futures Exchange, supervising the Trading and Clearing Departments. Prior to this position, Mr. Lin served as the Executive Vice President and Vice President of the departments of Trading, Clearing, and Business Development. At TAIFEX, Mr. Lin led the product development of single stock futures, gold products, weekly options, as well as the introduction of SPAN system and market-making schemes for the exchange. Mr. Lin has also worked for China Development Industrial Bank, Grand Cathay Securities Corporation, Chinatrust Commercial Bank, and Securities and Futures Commission. As a 30-year financial market veteran, Mr. Lin has extensive experience in securities, banking and derivatives markets. Mr. Lin holds an MBA degree from the University of Mississippi. Hyungun Ji is the Head of Derivatives Global Sales and Business Development in the Korea Exchange (KRX). His responsibility covers the sales and marketing for the KRX’s derivatives products targeting overseas investors and the business development and cooperation with other international exchanges. He started his career in the Korean financial market since he joined the Korea Futures Exchange (KOFEX) in 2000. In KOFEX, he worked in the international business and research team. After KRX was established by the result of the merger between the Korea Stock Exchange and KOFEX in 2005, he held a variety of positions in the KRX’s several departments including Derivatives Market Operations, Public Relations and the Secretary’s Office. He earned his MBA from the Ohio State University and a Bachelor’s degree in Economics from Sogang University in Seoul. Chris Edmonds is Senior Vice President, Financial Markets at Intercontinental Exchange (NYSE: ICE). In this role he oversees the development of initiatives within ICE's exchange listed and OTC financial markets, including all futures and options, credit derivatives, ICE Link and ICE Swap Trade. Since February of 2010 Edmonds served as President of ICE Clear Credit, ICE’s wholly-owned credit default swap (CDS) clearing house. As president of ICE Clear Credit, Edmonds was responsible for ICE's North American credit derivatives clearing operations. Prior to joining ICE, Edmonds was Chief Executive Officer of the International Derivatives Exchange Group (IDCG) a clearing house for interest rate swaps. Prior to IDCG, Edmonds was the Chief Development Officer for ICAP Energy. Edmonds held a variety of positions at ICAP between 2002 and 2008, and at APB Energy between 1997 and 2002. His professional career prior to APB Energy focused on advising businesses on strategic planning in the areas of technology, sales and marketing and operations. Edmonds earned a Bachelor of Arts degree in Political Science from the University of Alabama at Birmingham and is Series 3 and Series 30 licensed. Matthias Rietig is Senior Officer and Chief Representative of Singapore Branch ofOsaka Exchange, Inc. (OSE), the derivatives arm of Japan Exchange Group (JPX).Since joining Osaka Securities Exchange (current Osaka Exchange) in 2006, Mr. Rietigcontinues to lead OSE’s international derivatives marketing with a focus on drivinggrowth and expansion of OSEs global investor base. Also, he played a key role in theintegration of the derivatives markets between OSE and Tokyo Stock Exchange inMarch 2014. From 2012, he is based in Singapore for further development of thecommunication with Asian and Global investors. Prior to joining OSE, Mr. Rietig started his professional career with Deutsche BoerseAG in 1998 and left the company in 2003 for a short 8-month stint with MonexSecurities Inc. in Tokyo, one of the leading Japanese online brokers. After returning toEurope, he joined the Global Markets team at Deutsche Bank, covering Euro-bonds andAutobahn trades for the London desk before taking up a role as ECB watcher for theJapanese Ministry of Finance in Frankfurt. Matthew Lempriere is BSO’s Head of Asia Pacific based in Hong Kong. Matthew is spearheading BSO’s presence in Asia to build up a successful business across the region. Matthew brings a wealth of commercial, sales, client management, product development and marketing experience to BSO, with 30 years in the finance and telecoms industry. He had a successful career at BT Radianz and built and led Telstra’s Financial Services division. Matthew also holds long-term working relationships with some of the worlds’ largest financial institutions and within the high-frequency trading community. Ms Yeoh is the Regional Group Director for North America with Enterprise Singapore (ESG). Based in New York, she oversees ESG’s efforts in helping Singapore companies build capabilities, innovate and internationalise, through partnerships with North American companies. Her team is also active in promoting Singapore as the premier Asian trading location among North American companies. Prior to this, she spent three years in London as Centre Director with the former International Enterprise (IE) Singapore and Second Secretary with the Singapore High Commission to the UK. Her primary roles were to drive the overseas expansion for Singapore-based companies, as well as to advise international commodity trading companies on their business plans in Asia and Singapore. Russ Rausch is the Founder of Vision Pursue or VP. VP helps individuals and organizations create a Performance Mindset through their training and mobile app. Before founding Vision Pursue, Russ was the COO at the hedge fund Emil van Essen. Before that he was part of the executive team that took the trading software firm, Trading Technologies, Inc. (TT), from a 20-person startup to a 650-person global company as CFO, CIO, and EVP of Global Buyside Sales. Russ lives in Chicago.